Aix En Provence, France! Jewel of the South of France! After we nearly froze to death, (or so we felt), in Carcassonne, we decided to head to the other part of the South of France, the Riviera! And since my husband is an artist and everyone talks about the light and that many artists love Aix En Provence, we decided to go there first. Our train ride was just a beautiful experience riding through the fields around Avignon on the way! We love riding the trains in France! So much easier than dealing with airports, and you get to see all that magnificent scenery too. We arrived in the late afternoon and then had one of our worst taxi experiences. Our driver took us way out of the way so he could get a higher fare. But we consider that we were really lucky as that’s the only time it happened. After that I always Googled where the hotel was from the train station and the approximate fare so that would never happen again. Yes Google actually tells you that! Just click the little train icon when you are in the “directions” tab on a Google map. Sometimes Google is really your friend. But we were quickly distracted by the charm of Aix and forgot about that one experience anyway. Our hotel was the Sainte Christophe, right by the old town. It was a really nice hotel, luxurious even. We got it on Hotels.com and were very happy with our choice. I highly recommend Hotels.com! The Christmas decorations were still up in Aix and they were the best ones yet! We took lots of photos of them! It was holiday time, so the crowds were out all day and all night! The French love to party! We were in love by the end of the first night. Here’s the fountain of La Rotonde, decorated for the holidays. At the top are 3 females representing Justice, Agriculture, and the Arts. The main boulevard is lined with Plane trees and it was very close to our hotel so we walked it often. As you can see the street was still decorated to the hilt for Christmas! From there you can visit the old town, or go North and East to the newer shopping areas and the town markets and the many charming squares which have fountains and trees and cafes to relax and have a cup of coffee or tea. And bread. The French are in love with bread. We can’t figure out why they aren’t all fat. But we hardly saw any fat people in France. They’re mostly very slim. They do walk a lot, so maybe that mitigates the bread. They also eat very high fat. Lots of butter! And lots of veggies. And lots of wine. Incredible wine! And very cheap! I couldn’t get over how cheap and good the wine was! But I digress…. As in many of the ancient towns in Europe, the original town is preserved complete with winding narrow streets with very tall buildings so you are in a maze walking around, and it’s very easy to get lost. But by this time I had figured out that I have a compass on my iPhone, and it comes in very handy! So we hiked in the forest up to a hill where we could see a lake surrounded by Pine trees and smell all the forest scents. It was lovely and we felt like we got a real taste of the French countryside. It wasn’t Spring so we couldn’t see any lavender blooming, but we did see some of the fields on the way to the park. What a completely wonderful day! The rest of the time we spent exploring every nook and cranny of the old town and shopping and eating and visiting the fresh food markets. The markets in France are incredible. If I lived there I would never shop anywhere else for food. Many Americans live in Aix En Provence, and I can see why. The food, the light, the ambiance, the very nice people, it’s just unbelievably wonderful. Of course, I can’t leave without a photo of stained glass from a Cathedral! There are several beautiful churches in Aix, but a couple were being worked on so they were closed, and a couple were so dark my photos are too dark. This is the only one that came out. After 4 days in Aix En Provence, France, it was time to leave, but we didn’t want to! However the Riviera was calling. Next stop: Nice! 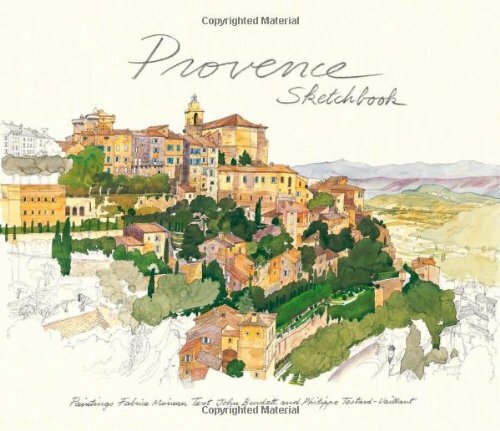 Here’s a beautiful book with watercolor drawings of the Provence region of France. Perfect for your coffee table after you get home from your trip to the South of France. Add to your memories.